Folkestone’s former Rotunda Amusement Park, typical of seaside towns from Blackpool to Coney Island, was not only the inspiration for Richard Wilson’s 18 Holes but also provided the materials. The dysfunctional and long overgrown crazy golf course was the only remnant of the otherwise erased park. Wilson’s herculean project of cutting, lifting, restoring and reassembling the eighteen weighty concrete slabs is a tribute to the memory of this former popular tourist attraction. 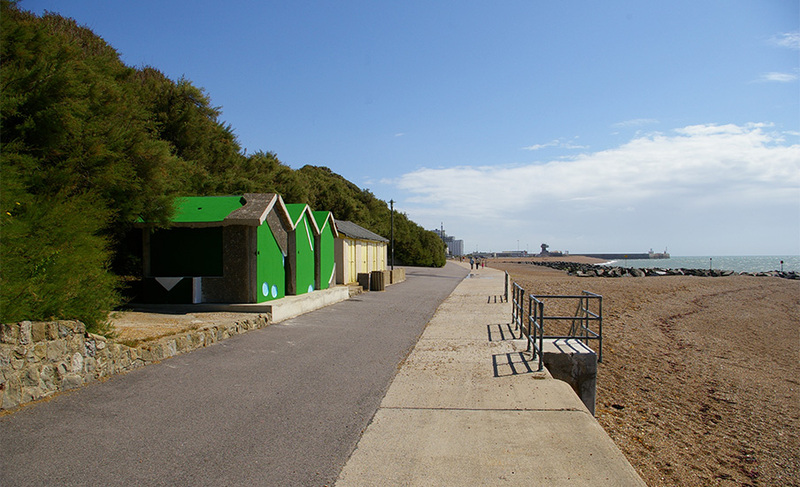 Wilson’s three ‘crazy’ beach huts are installed only a few hundred metres away from their original site and alongside the existing series of beach huts like concrete bunkers. When the Rotunda Amusement Park closed in 2003, Folkestone’s long and largely happy relationship with traditional seafront attractions came to an end. Former fairground thrillers such as the log flume, Castle Dracula and the vintage 1922 rollercoaster were all removed from the site, leaving a large void to the west of the harbour. After the rides were removed, anyone seeking evidence of the area’s fun filled history would have only found the crazy golf course, covered in weeds with its felt-lined fairways rotting away. But all 18 holes of the course were cut out, removed and re-purposed by Richard Wilson as three striking and quirky beach huts a few hundred yards along the coastal path. Wilson was advised that the concrete would be almost impossible to move. 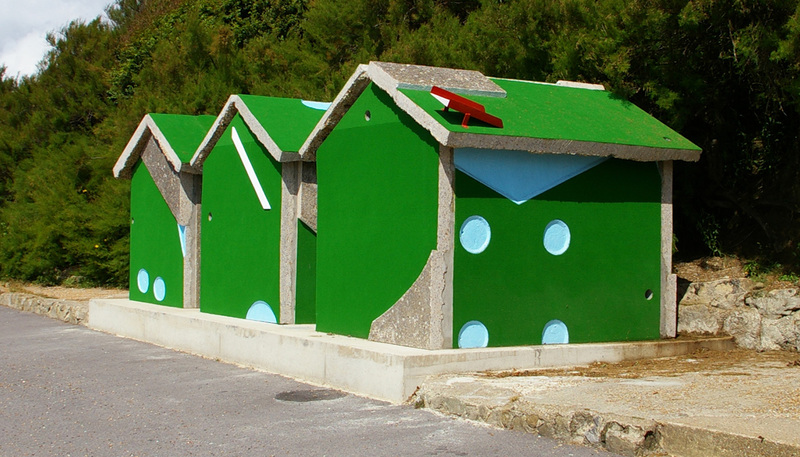 But the artist, known for his success with spectacular feats of engineering, completed the construction of each hut using six flat slabs cut from the floor of the crazy golf course. The soft green surfaces have been resurfaced, the paint work retouched, and the crumbling neglect has been replaced by a cheerful solidity. The sculpture is a reminder that Folkestone is moving on from old fashioned seaside fun and finding new ways to attract people to the town and provide a stimulating environment for existing residents. This small act of regeneration also suggests that the past has an important role in shaping the future.